We all know very well that Acer is a Taiwanese multinational hardware and electronics corporation specializing in advanced electronics technology and is headquartered in Xizhi, New Taipei City, Taiwan. However, now according to the latest reports, the well-known Taiwanese company, of course, Acer just launched the world’s lightest 15-inch laptop. Acer is a Taiwanese multinational hardware and electronics corporation specializing in advanced electronics technology and is headquartered in Xizhi, New Taipei City, Taiwan. Recently the Taiwanese company Acer has launched a new laptop which is actually less than 1cm thick and dubbed as the Swift 7. 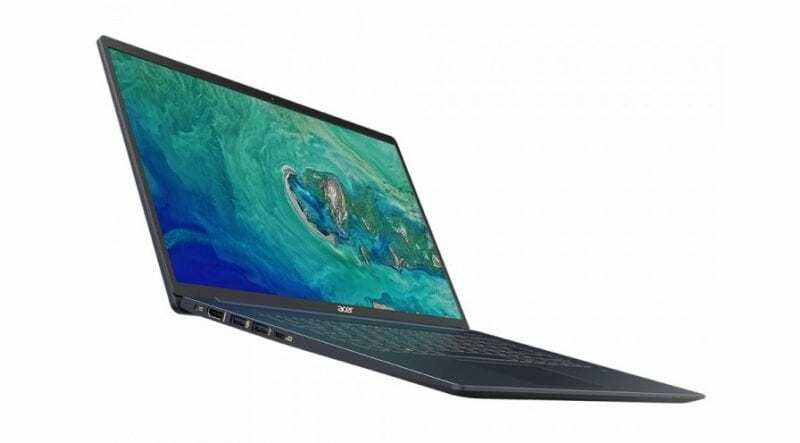 While Acer already unveiled on the Global Press Conference which was held at IFA Berlin, the new Swift range of ultra-thin and light notebooks. Consisting of four different series, including the Swift 7, Swift 5, Swift 3 and Swift 1, the new ultra-thin models will come with Windows 10 and are adapted to all budgets and lifestyles. But, if we talk about the Swift 7 then it is light and thin like a pencil, it only weighs just 1.1 kg and is 9.98 mm thick, making it the world’s first notebook less than 1 cm thick. The combination of two colors, black, and gold add a touch of elegance to the unibody aluminum design with high durability, while Corning Gorilla Glass ensures scratch resistance in Full HD IPS screen that has a very small frame. With up to 9 hours of battery life, it is the perfect portable for mobility. Acer remains very strong in the segment of portable PCs and more. Framed in IFA 2018, recently the company just introduced the Acer Swift 5, the world’s most lightest 15-inch notebook. This lightest notebook is basically designed for consumers looking for an exception computer, as the Swift 5 delivers exceptional performance in a sleek chassis that weighs less than 1 kilogram (990 grams). Let’s get to know other characteristics of this notebook. Despite being the world’s lightest 15-inch notebook, this laptop has a number of very interesting features that make it quite powerful and different in its segment. The all-new Acer Swift 5 comes equipped with an Intel Core i7-8565U or Core i5-8265U CPU and guarantees a range of around 10 hours of autonomy. At the operating system level, Swift 5 comes with Windows 10, the tech giant Microsoft’s latest Windows operating system. Moreover, the all-new Acer Swift 5 includes up to 16GB of DDR4 SDRAM and storage of up to 1TB NVMe SSD PCIe for fast boot and file access. Users can take full advantage of system performance and long battery life even at night with the LED backlit keyboard. The all-new Acer Swift 5’s Full HD IPS touchscreen (1920×1080) has ultra-thin frames only of 5.87mm, which alters to an exceptional 87.6% screen-to-body ratio to create an immersive viewing experience. Users can also enjoy a fast and reliable Wi-Fi network connection with gigabit performance thanks to the integrated 2×2 802.11ac adapter. The all-new Acer Swift 5 also includes several connectivity options, such as a second generation Type 3.1 USB C port capable of transfer speeds up to 10 Gbps, Power Delivery support and connection to an external monitor, two USB 3.1 Type A ports (one with support for charging with the computer off), and an HDMI port. Now, if we talk about the price, the all-new Acer Swift 5 with 15-inch screen will be available in five variants and here are the price tags of those five variants 849.99 (SF514-52T-51MV), 899.99 (SF514-51-706K), 999.99 (SF514-52T-50AQ), 999.99(SF514-52TP-52LH), 1399.99 (SF514-52T-82WQ).